the long weekend will be a good time to think about, or even draft, your email of protest for the yarn rant, which will take place later this week on Thursday, June 1 please make a note to come back, press the logo to the right here, and download the email list on wednesday night or thursday. also, don’t forget the STALK-n-KNIT contest! as of right now, anyone who enters has a great chance of winning! i hardly ever pack ahead. ever. i’m mostly just too cramped for time to do things like that ahead. yeah, and BTW, . . . it’s NOT all that sunny and gorgeous here today (in the photo—that’s just the magic of photoshop . . .). actually, it is raining so hard right now, that i literally can’t see across the street. it’s supposed to clear up by the wee hours of the morning, and even get sunny by tomorrow. but we know where we are . . . northeast ohio has the second heaviest cloud cover in the USA. yup. and no, i did NOT know that when i moved here. sigh. live and learn. in fact the cloud cover is SO profuse, that the US government built some sort of big arsenal here because it would be so well protected. until now of course . . . you know, because of all those spies reading my little knit blog . . .
sigh. i hope it doesn’t rain like this tomorrow. it won’t keep me home if it does—it just makes everything feel so sticky and damp. and then there’s also no place to sit and eat lunch. 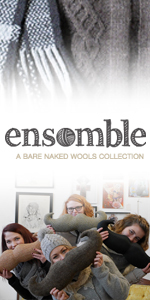 i’m bringing my camera for sure—must share the wool love. she’s just the cat’s meow! 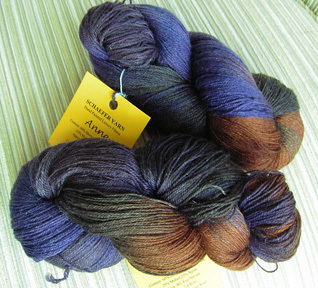 this more-or-less DK weight yarn is the superwash merino. 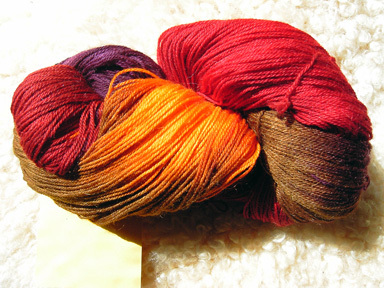 it reminds me a lot of the mountain colors DK weaver’s wool, as far as it feels, etc. 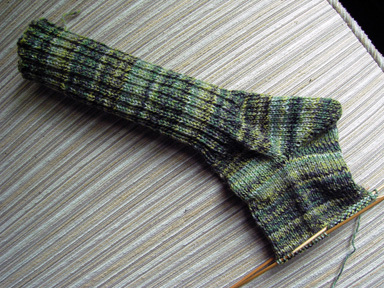 there isn’t enough for a sweater, but maybe a couple or three smaller projects. thank you, deb! AND, might i add, something like this could be yours for free! if you enter the blog contest (press the button in the sidebar for more info). 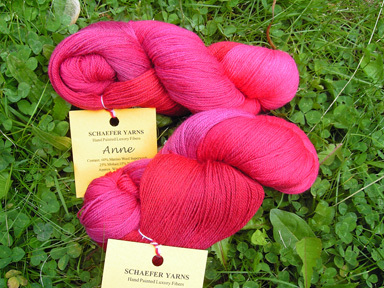 free yarn, no purchase necessary, plus a fun time; what is everyone waiting for?? go enter! oh, and just so you know—i am NOT the only pointy-footed person on the planet. yes, yes, i might have the pointi-EST feet, but i have emails now to prove that i am not alone in my pointilism. i’m always glad when one of these pairs is done. they are big, and i get a little bored toward the end of each pair. but i like starting them! 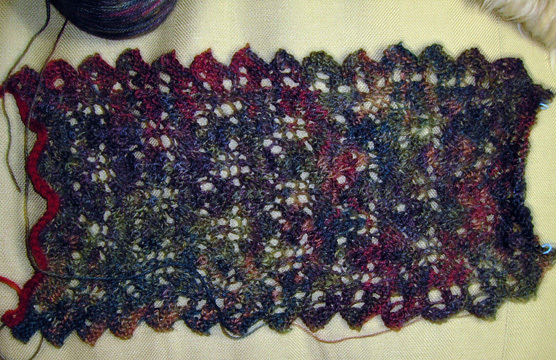 if i use a variegated yarn, that moves things along nicely and i’m making headway on the pair from the hand-dyeing experiment a few weeks back. his socks alway scare me at how wide they are. is it unusual to have socks that need to be between 9.5 and 10 inches around (my own are only 7.5 inches around, hence the nervousness)? any guys out there who know? socks . . .); it feels sturdy, but not scratchy. we had a great discussion in class the other night. 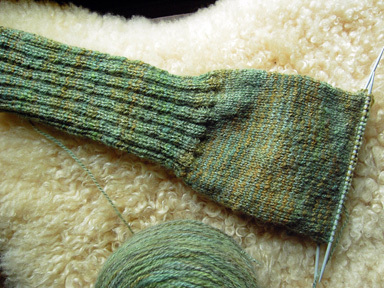 it started with some talk about anatomical toe shaping for socks (i know; i guess we just ran out of good gossip). and of course my pointy feet had to be dragged out for a few laughs (not to worry, they are quite used to it). 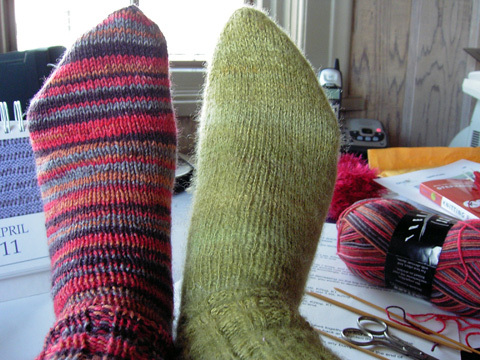 (the one on the right is the true shape; the one on the left is partially masked by toe shaping that is not quite form-fitting enough. sigh. but it does show you what good camouflaging can do). now, on wednesday evening, i have a core group of people who just take the same class over and over while working their way through ever-more-challenging projects. they are getting to the point where they are starting to ask questions. not like “do i have to do a gauge swatch” or “WHAT does SSK mean, again?“. and we began talking about just WHY people should do continue with class for a lifetime an extended time without stopping. well now, that gave me the shakes, cuz, i think that means that i am the captain of that ship. and if so, it is me who is going to have to keep everyone from drowning when they dive right in to a project that is above their head. and i am afraid that i have encouraged this along the way, never dreaming that they too, would eventually decide to march to their own proverbial drummers right in the middle of some sweater or (i shudder to think) lace doo-dad. now my big decisions are almost always intuitive, so i have to really sit and analyze them in order to explain how i come to them. once i have that flash of inspiration, of course i drag out the tools of the trade and add technical know-how. teaching it all to someone else, though—hmm, that will be a big step for me! but this week i have the opportunity to observe my process a bit more. 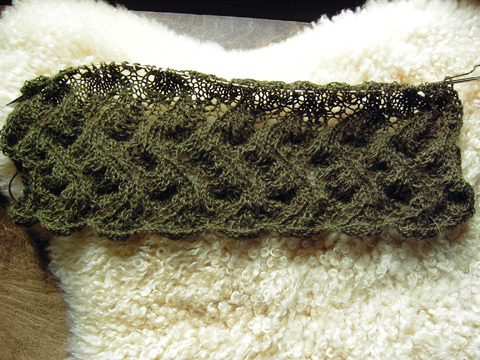 i’m working on three or four new lace designs, all inspired by yarn. well, in large part by yarn, and then there are other contributing forces. i don’t even know for sure what each of these designs will result in. triangle shawl, rectangle stole, scarf, or blouse? right now, i am just playing with swatches and ideas, which, in itself, will help hone the decision-making process. there are so many factors to consider—if i tried to tackle them all at once, i would go mad! so usually, i just start with daydreaming and whittle away at the design from there. 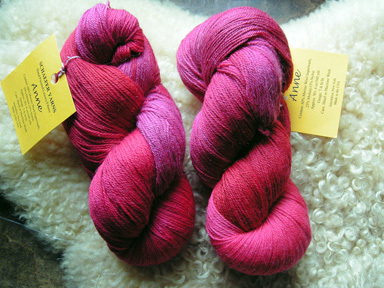 but i think i can answer one question today at least, the one about the variegated yarn. 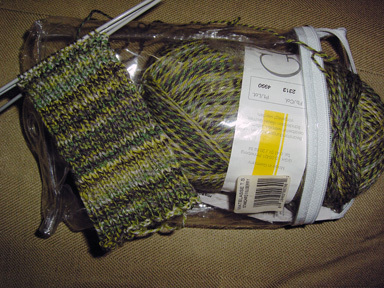 i like variegated yarns for long repetitive projects, like stoles and shawls. put quite simply, they keep me entertained. 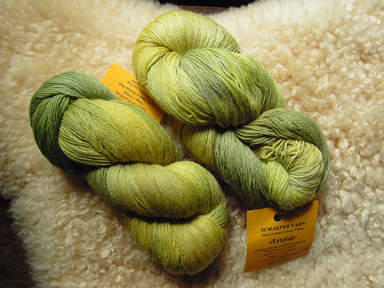 but not every variegated yarn is meant to be knit into lace. 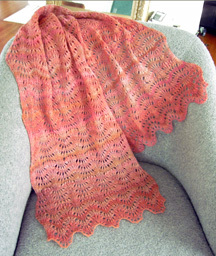 this shawl is knit from just such a yarn, but it’s very delicate quality still stands up to it. 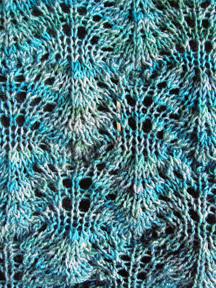 this type of variegated needs to be used a little more carefully when thinking about lace. 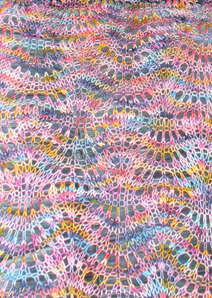 if the lace pattern is very delicate or has straight horizontal lines, the more complex variegation could interfere or overwhelm the pattern. 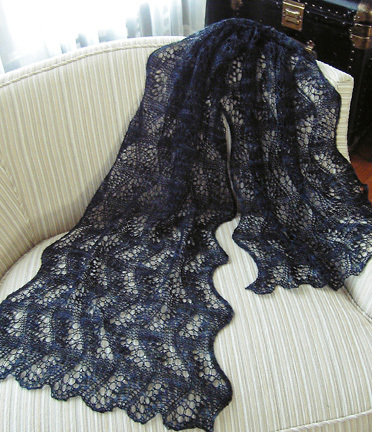 however, some lace patterns have naturally sinuous horizontal lines, and i find that this type of variegated yarn does a bang-up job of accentuating those voluptuous curves with movement, while not overwhelming the fabric. the key is the tonality—while the colors vary widely, the tones are very close; there is not much difference between dark and light. and that provides the continuity that saves the piece. this piece actually has all the same colors as that rainbow swatch up top, but its many colors are toned-down so much that they begin to harmonize. and here we have an example for which the exact reverse is also successful; the colors are similar, but the tones are dissimilar. 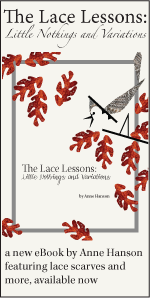 the lace pattern is accentuated without being hidden. of course, all that said, i am about to experiment with breaking the rules. i’ll keep you updated. surrounded by sunlight, those colors just roar! then, i put it in the grass, which is several times greener than usual from all the rain we’ve had. now green is opposite to reds/pinks on the color wheel, and therefore in direct contrast to it, so i’m expecting it to pop, but i did not expect this. are you ready for your eyes to bleed? just remember this progression of scenes next time you are choosing “something bright” for a project. some time, i will write about color relativity. its a fascinating topic. for now, go rest your baby blues. i have been (maybe blissfully) unaware of this blog being noticed. i write it, and fool around, and wisecrack away, and i always feel like i’m talking to a really intimate circle of people, who i have come to worship. once in a while i do something that i fervantly HOPE will get noticed, but there is never any way to tell (or so i thought). lemme backtrack for a sec—i know next to nothing about using internet-based software, or how it really connects us all—pingbacks, trackbacks, incoming/outgoing links, etc, etc—well (blush) i have no idea what anyone is talking about. trying to sort it all out in these 3 months i’ve been blogging makes my eyes glaze over and my head roll back. a lonely wind whistles through my ears and i start thinking with my mouth open (don’t worry, i DO usually catch myself before i start drooling). i thought it was one of those lists like you see on amazon, where they tell you which other books you’d be interested in buying? i thought they were telling me what other sites i would like, according to relevance. and i clicked on one. 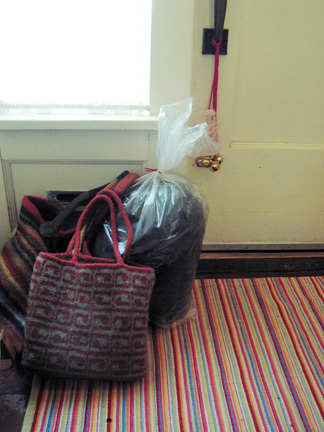 and there, on someone’s site who i don’t know, and who is not on my mailing list, was a link to Knitspot!! i was SO excited!! and then i went back and clicked on more links and more. and GUESS WHAT?? 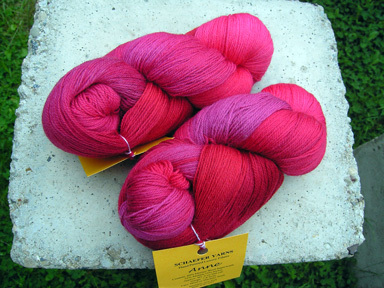 A LOT OF BLOGGERS AND PODCASTERS ARE MENTIONING THE YARN RANT! WOWIE! HOORAY FOR THE INTERNET COMMUNITY! we’re KNOT taking any more! my email list is long folks; you will have plenty to choose from. 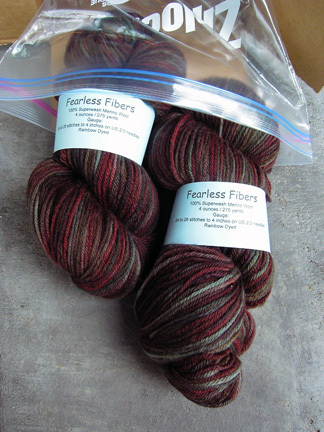 AND a few posts i’ve read lately (The Needle and the Damage Done: Rant and SO MUCH YARN, SO LITTLE TIME! and Grumperina) make me think that next year, we should target the publishers . . .